Worst CoD! Refrained from voting. In what way? You mean MP? heat added. great story. MP was a chore. Agreed. Although I played some MP I stuck with extinction and did the campaign twice. It was the easiest veteran campaign to date but worth it and when Eminems - Survival played and you got the gold trophy / achievement it was worth it. MP currently is amazing. dedicated players online who dont camp play currently as the masses of 12 year olds have flocked to play advanced warfare. also season pass with wristband for ps4 can be picked up for £10 on amazon, great MP maps and all extinction maps for a unbelievable price. HAVE SOME HEAT! MP currently is amazing. dedicated players online who dont camp play … MP currently is amazing. dedicated players online who dont camp play currently as the masses of 12 year olds have flocked to play advanced warfare.also season pass with wristband for ps4 can be picked up for £10 on amazon, great MP maps and all extinction maps for a unbelievable price. HAVE SOME HEAT! ah seems sold out since I purchased. google ghosts season pass with paracord band and look on ebay for the pass at a discounted price to the psn store. Isn't it hacked yet and unplayable? What usually happens to the current cod when the new ones are out. What the douce is Siansburys!? I play through every CoD campaign during the first week after launch until the multiplayer servers settle. The Ghosts campaign must have been as forgettable as all the others as I don't remember it! Actually CoD 4.. THAT was a campaign to remember. This hot uk DEALS not hot uk OPINIONS. Vote on the DEAL not on whether you like the product. This is a fantastic DEAL. Voted accordingly. This hot uk DEALS not hot uk OPINIONS.Vote on the DEAL not on whether you … This hot uk DEALS not hot uk OPINIONS.Vote on the DEAL not on whether you like the product.This is a fantastic DEAL. Voted accordingly.Sigh. Actually I saw this in my Sainsburys (st clares/hampton) for £5 the other day also. Sadly only the xbox one version. There were a couple of copies there then so maybe it's a more widespread offer. It does actually have a big save money label rather than just a sticker change only. Sure not the best CoD available but play through the campaign and have 5 minutes on the multiplayer and it's a good price at a fiver. Campaign is worth a fiver, dog bit was pants though (although the bark button was quite amusing!). Multiplayer was garbage IMO, maps were too big and again the dogs were annoying. Shoot the bloke, get eaten by his dog or kill the dog and get shot by the bloke... There was only one way to play it, grab a nice rug, some sandwiches and a flask then find a place to park up, CoD really does mean Camp Or Die in this game. Like I said though, there's a fivers worth of entertainment to be had in the campaign for sure. People moaning about people giving their opinions, hypocrites. Yes its cheap, but its cheap for a reason and they're only trying to help people not waste money. 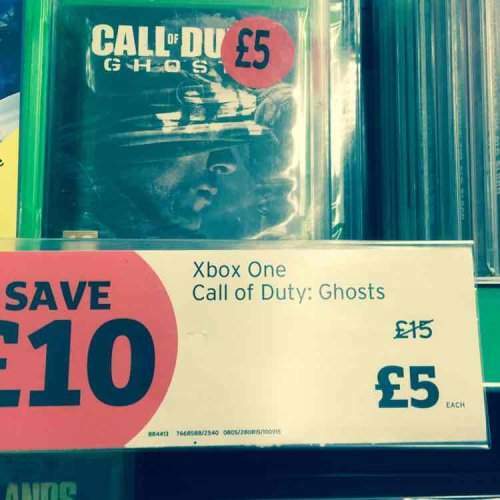 Ghosts is crap, it wasn't worth the £15 I paid for it, its barely worth £5. If want to waste £5, enjoy. Worth a fiver for the campaign alone. Seriously underrated comment right here. Voted hot despite not being in my local. If only this would be available at our locals. Is this also available on PS4 at this price?